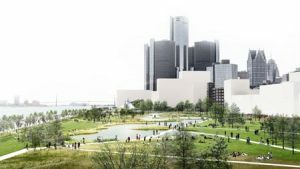 Detroit East Riverfront Framework Plan, by Skidmore, Owings & Merrill LLP, is one of the projects receiving the American Institute of Architects (AIA) 2019 Institute Honor Awards for Regional and Urban Design. The five-member jury evaluates each submission based on how well the design addresses environmental, social, and economic issues through sustainable strategies. This includes the ability to collect and distribute resident renewable resources and energies, while enhancing quality of life and promoting social equity.